But that’s okay, really. As long as a positive message of diversity, no matter the intent, is disseminated and represented as much as possible then that ultimately helps people and lets them know they are allowed to thrive. Few comic book companies have avoided presenting gay characters in their books though often they were hesitant or clumsy in their presentation (though not so misguided as much as it was well-meaning as most of the depictions of African-Americans in the comics of the 60s and 70s). Among the current higher profile gay characters are of course Archie’s Kevin, Marvel’s Northstar, who has been out for years and DC’s Batwoman. The latter two being good examples of characters the respective companies have been mostly at a loss since their creation as to how to portray them. 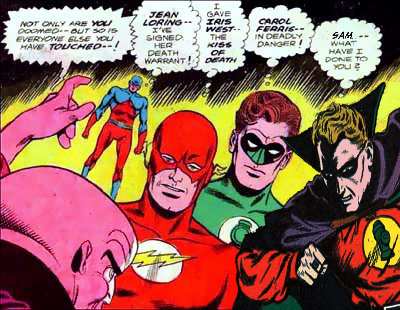 A few groups had issue with the news of Northstar getting married to his long-suffering boyfriend and the re-introduction of Alan Scott as gay. They claimed an agenda on the part of the comic companies and the usual tired old argle-bargle of the negative influence of comics. They have been mostly dismissed and marginalized by those motivated to be vocal about the issue. I’m cynical enough to believe that the only agenda Archie, Marvel and DC have is to make money. It is from the increased national discourse on homosexuality and the demands for equal human rights that companies like DC can comfortably exploit (and I mean that in the best way) sensitive political and cultural issues. That their savvy marketing direction can also positively add to the discourse in however a small way is a benefit. In the 1970s Marvel successfully tapped into the sentiment of the young on many hot-button issues, a trend that benefited the bottom line well into the 1980s. From the 1960s through the 1970s DC was the company that had the most precedent, albeit steeped in subtext, in exploring gay issues though this was found mainly in the pages of the various romance titles amd one had to read between the lines and ignore the conclusions to most of the tales to see it. Marvel, however, reveled in being relevant and routinely tackled social issues such as class and race. This was all about what the audience would accept and want. The same company that railed against “The Man” in the 70s was fully behind the institution of authority a decade or so earlier even in the progressive and socially conscious 1960s, when mainstream comic companies adhered to the idea of Camelot and the Cold War. DC also missed an opportunity to introduce the first openly gay Green Lantern back in the 1990s. When Kyle Rayner (whom I always thought of as bi-sexual) was injured he sent his ring for safe-keeping back to Earth to his intern Terry, a gay man. My expectation was that Terry would spend the next several issues using the ring, going through a steep learning curve and maybe experiencing some interesting character growth. That didn’t happen. The next issue Kyle reclaimed his ring and continued his adventures as if nothing had happened and it seems DC either dropped the ball or felt they dodged a bullet. However progressive a comic book might be it isn’t going to change the world in and of itself. Alan Scott being gay and Northstar getting married won’t change anyone into a homosexual anymore than the Teen Titan Spotlight book featuring Starfire ended Apartheid. What it might do, hopefully will result in, someone feeling better about themselves in spite of what the cranks, superstitious, evil and simply backwards have to say to the contrary. Being gay is not different. Being gay is not evil. Being gay is not wrong. It just is.